View The 427/700HP Dyno Session Here! All The Power And Bling Of A Supercharged Engine With The Simplicity And Driveability That A Single Carb Package Delivers. Not Only Fulfills Your Need For Speed But Also Provides The Look And Sound To Set You Apart From The Crowd. Fits Under The Hood Of Most Pickups And Old School Hot Rods Like The Tri-Five Chevys. Later Model Iron Works With The Addition Of A Simple Cowl Hood. 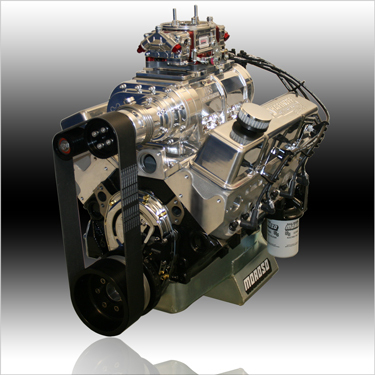 Best Of All This Package Is Priced Thousands Of Dollars Less That A Dual Carb 8-71 Blower Package. Sounds Like A Winning Combination For A Lot Of You Hot Rod Fanatics ... Doesn't It?